The second module addressed that ways that social ties between individuals establish the foundation for group formation, and networked groups build a society. Within a society, people interact according to social expectations, norms and values. Yet, sometimes the precepts for social interaction and behavior are not always clear. This is particularly the case is in larger complex (stratified) societies comprised of a diverse array of groups and individuals, and codes of behavior, or laws, can be implemented to establish the social order of the society. This segment will address the role of law in society. Fambul Tok is an example of an internal management system that facilitates social order, conflict resolution and decision-making. In large scale societies however, codes and legal frameworks organize social groups and enforce an external regulatory system. 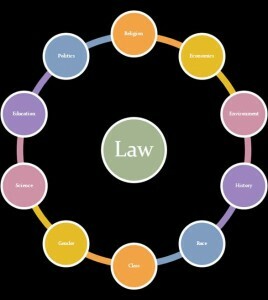 State-based legal systems are characterized by the integration of politics, law and the military apparatus. The state derived authority from a legal system that provides the state with a monopoly on violence. What this means is that only members of the state are authorized to use lethal force either through the implementation of a ‘death penalty’ or through ‘law enforcement.’ According to Richard Collier (1995), is rooted in the patriarchal authority of men in the household. In his book, Masculinity, Law and the Family, Collier explains how legal systems transfer male authority in the household to the state. Legal systems allow state authority to penetrate the community, household, family, and even interpersonal relations such as marriage. Interpersonal relations and disputes that were once negotiated between parties by elders, councils, and other community leaders fall under the new authority of the state. 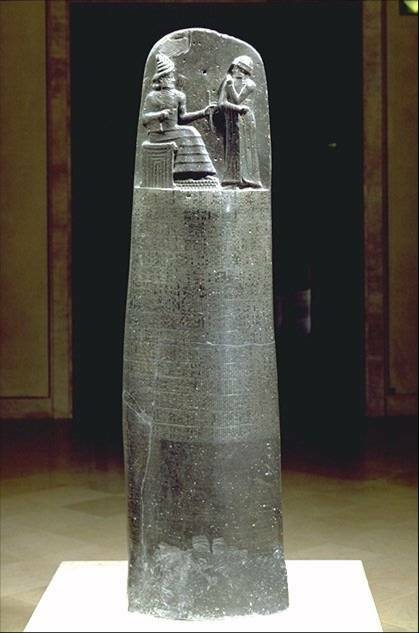 The Code of Hammurabi is the best preserved ancient law code dating back to nearly 2000 years. Several steles positioned throughout Babylon listed more than 200 laws that addresses contracts, family law, rights and entitlements, social status, and punishments. The legal code established by Hammurabi characterizes the nature of external regulation within a highly stratified society. The law codified social inequalities by establishing different rights and entitlements for specific social groups within the society. Punishments varied according to the social status of the individual, and family law was structured according to gender inequalities. The legal code institutionalized power and inequality based on wealth, power and prestige. Today, contemporary anthropologists aim to identify the ways that contemporary legal structures codify and institutionalize power and inequality. The anthropology of law aims to explore legal systems not so much as a mechanism of social control, but as an instrument of power (Starr and Collier 2008). There are two distinct approaches to investigating the role of law in society. The first approach relies on a rule-centered paradigm which positions law as a system of social control through the imposition of sanctions legal procedures as a means of enforcing norms. This perspective considers law as an external regulatory force that is enacted on society. Yet, critics argue that the rule-centered paradigm ignores the socio-historical contexts in which laws are created and implemented. The second approach is based on a processual paradigm which rests on the notion that conflict is central to social life and that laws are not determining rules, they are part of a process of negotiation in conflict. From this perspective, legal structures represent systems of meaning that are embedded in social norms, value and practices that relate to conflict and resolution. According to Merry, legal frameworks are not based on moral Truths about right and wrong, they are structured according to social values and norms as well as meanings attached to legal processes. From this perspective, the roots of the legal system reach far beyond the codes and proceedings that enforce them, they begin with the social consciousness of conceptualizing problems and seeking meaningful ways to resolve them. This analytical framework offers an interpretive lens for understanding the multiplicity of different legal systems worldwide because each system is embedded in a unique socio-historical recipe that shapes the way people construct systems of meaning. The interpretive approach to legal structures opens the door for an interrogation into the ways that hegemony and power shape legal systems and processes. If legal systems are embedded in systems of meaning, then they are also embedded in hegemonic ideologies that shape they way people conceptualize problems, perceive of rights and entitlements, and consider what is ‘right,’ ‘normal,’ and ‘fair.’ For example, if a member of a marginalized social group believes that they are not entitled to the same rights and privileges as other members of society, then there is little probability that a dispute will arise if the person is infringed upon and the legal framework will not provide protection from the infringement. In this way, hegemony shapes legal systems and processes. George Marcus and Michael Fischer (1986) argue that legal structures maintain social hierarchies and inequalities, and it is therefore necessary to connect legal institutions and practices to larger historical processes. The resolution of conflict is not restricted to the local stage, such as a dispute between two parties within a courtroom. According to Marcus and Fisher, the one-on-one dispute in the courtroom is embedded in a more broad conflict between the interests of different social groups. For example, the Women’s Suffrage Movement in the United States was not only about the legal right to vote, it was embedded in a larger conflict centered around ideas about gender equality. Land allocation deeds during the British colonial system in Uganda and India was not about the private ownership of each individual, it was embedded in a larger colonial context of European entitlement to occupy foreign territories. According to June Starr and Jane Collier (1989), laws are never neutral because they create and maintain asymmetrical power relations. It is conflict, not consensus, that is the enduring aspect of any legal order, and the legal resolution to conflict is based on the power structures that shape the relationships between the parties in dispute. Inequities in the laws and the legal process are rooted in social inequalities in society. The previous module addresses de jure discrimination which is discimination that is institutionalized by legal codes and practices. Jim Crow laws in the United States and Apartheid in South Africa are examples of institutionalized racism. Changes in the laws came in the wake of powerful social movements that reframed the meanings attached to social groups from a system based on inequality to one of equality. Despite significant progress, critics argue that current legal systems continue to reflect and reinforce social inequalities in society. The racial distribution in death penalty selection and execution has become a highly controversial topic in the U.S. during recent decades. A congressional report entitled, ‘Racial Disparities in Federal Death Penalty: 1988-1994’ found that 89 percent of defendants selected for capital prosecution have been either African-American or Mexican-American. At the same time, women are less likely than men to be sentenced to death for murder, and of those receiving death sentences, women are less likely than men to be executed (Why Women Aren’t Executed: Gender Bias and the Death Penalty’ Human Rights. Similarly, critics have argued that differential sentencing between crack and cocaine convictions reflects racial bias. In 1986 the U.S. Sentencing Commission recommended, and Congress adopted, the Anti-Drug Abuse Act which specified a “100-to-1” quantity ratio in its Sentencing Guidelines. The ratio is therefore applicable to all federal offenses involving crack or powder cocaine. The legal framework specified that at every quantity level federal defendants convicted of a crack cocaine offense receive the same sentences as powder cocaine defendants convicted of an offense involving 100 times as much cocaine. The reasoning behind the sentencing ratios were unclear because cocaine contains significantly more narcotic substance that crack. Yet the statistics for federal crack convictions in 1993 were 88.3% ‘African-American’ and 4.1% ‘White’ while the numbers for federal cocaine powder convictions were 32% ‘White’ and 27.4% ‘African-American.’ Federal cocaine laws have had a disproportionate impact on ‘African-American’ defendants. The Fair Sentencing Act of 2010 (Public Law 111-220) reduced, but did not eliminate the disparity between the crack cocaine and powder cocaine penalties to an 18:1 weight ratio and eliminated the five-year mandatory minimum sentence for simple possession. Since law is embedded in society, then changing laws can implement changes in society. This is a key aspect of the next module which will address agency and the capacity of individuals to initiate change by working alone or collectively. Readings: Gelderloos, Peter. 2010. The Justice Trap and the Disempowerment of Society. Moscow Papers and visit River Phoenix Center for Peacebuilding. Discussion: Locate a news article that addresses a specific conflict. It does not matter if it is a small-scale dispute between two parties or a large-scale dispute between large groups. Use the terms and concepts presented in this lesson and the Gelderloos reading to make your case for devising a meaningful way to achieve a resolution to the dispute. Would you recommend a punitive approach that will enact a penalty on those who infringe? Or would you implement a means of seeking restorative justice through a community-based system of conflict resolution? Be sure to include a link to the article in your post. When you complete the discussion, move on to Religion lesson.